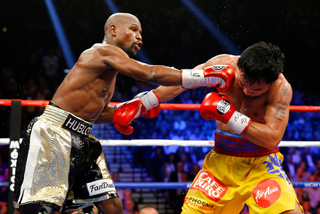 Mayweather vs. Pacquaio: THE AFTERMATH ,Don’t hate the player…hate the game! Floyd ‘Money’ Mayweather didn’t invent the sport of boxing or the rules and regulations associated with it, but now that he has masterfully capitalized off of it he has become the brunt of criticism. Last Saturday May 2 in Las Vegas at the MGM Grand Garden Arena, Mayweather defeated Manny Pacquaio in a fight billed as one for the ages. The hype leading up to the epic showdown was so astronomical that if both fighters had been knocked out ten times each, it would not have met the unrealistic expectations of the millions who invested in it. It was a match-up hatched out of necessity and not greed that has been speculated. The money came about as a direct result of the demand generated by those media conglomerates that deemed it so essential. Oh, and there were many from England, Germany, Canada, CNN, ESPN, ABC, CBS, Fox, Sports Illustrated, The New York Times, The Wall Street Journal, the Los Angeles Times which could not tell Mayweather from Timothy Bradley (I guess all of Black guys look alike), TMZ, TNT, and far too many to even mention here. It was a promoter’s dream. Don King would have hit a home run with it, Bob Arum is mad it wasn’t all his, Golden Boy Promotions was fuming they didn’t have it. Instead the lead promoter was the new kid on the block Mayweather Promotions. That Mayweather and his promotional company controlled every aspect and condition associated with this event, that pissed off a whole lot of people, except for Showtime Network and HBO which stood at the alter to cash in. The company also approved and declined media request, and I can tell you that few Blacks that I know of were not approved of the event. The fight itself was not the Thriller in Manila or Rumble in the Jungle or The World Awaits. It was yet another opportunity for the best candidate to solve the Money Rubik Cube, and Pacquaio failed miserably. With his Hall of Fame trainer Freddie Roach in his corner, he did not cut off the ring, did not bum rush Mayweather with his familiar reckless abandon and thus pretty much quit trying on his feet. Mayweather took it all in, but probably should have listen to his father and just went in for the kill and knocked Pacquaio out. The end result was that neither man tried to brutally hurt the other guy and for that, both are to blame. Mayweather got a $100 million check for his waltz and Pacquaio got a check, but who knows for how much. He reportedly owes $18 million in taxes to the United States, another $40 million to this native Philippines. Reliable sources say that his promoter Arum get’s 30 percent off the top, trainer Roach 15 percent, another group of mangers 15 percent and his advisor 20 percent, leaving him with 20 percent. So, you can see why Pacquaio sounded delusional in saying that he won the fight afterward and later revealed that he fought with an injured shoulder. He went from being one of the most likable men in sports to one that threw away all of the credibility he had. Pacquaio may well be injured, but he took a horrible time to tell anyone. He was also injured when in his first Juan Manuel Marquez fight when he fought 12 courageous rounds in an action packed thriller. The bottom line is Floyd ‘Money’ Mayweather is now 48-0 and richer than any fighter in the history of the sport, thanks in large part to advisor Al Haymon. He’s undefeated because he is more gifted than anyone else. He’s richer because he’s smarter than any fighter. He should be applauded because he played the game and didn’t get played!